One of April’s occasions for accessory lovers was surely the unveiling of the new Givori collection at the Dubai Bride Show Exhibition 2010, sold exclusively at Axiom Telecom spots, and Harvey Nichols Dubai, Mall of the Emirates, UAE. A collection of fine jewelry was handcrafted in England and is named after Calypso, the Greek nymph of the sea. 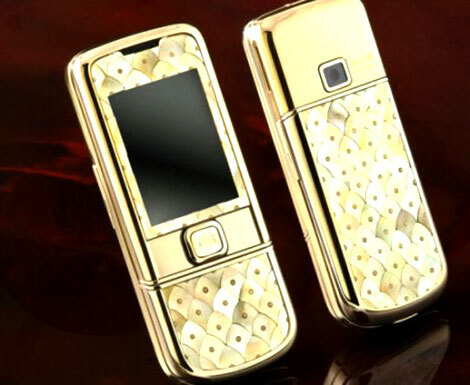 One of the main exhibits is Nokia 8800 handsets, done over in 18 karat gold and mother of pearl. Shaped as fish scales, mother of pearl is fixed on gold pins in a truly remarkable design. The Givori Calypso luxury collection comes in a Classic edition priced at $2,400, and an Exclusive edition costing almost twice as much. The latter includes a navigation key decorated with a round 0.22 carat diamond solitaire, and a pearl pendant of a baroque shape. 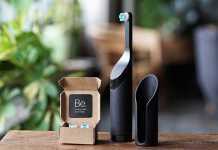 It also offers the amenity of personalizing your handset with your name or initials. Source of the image: Elitechoice.org.